Compare this with a single feather board cost- Great value! 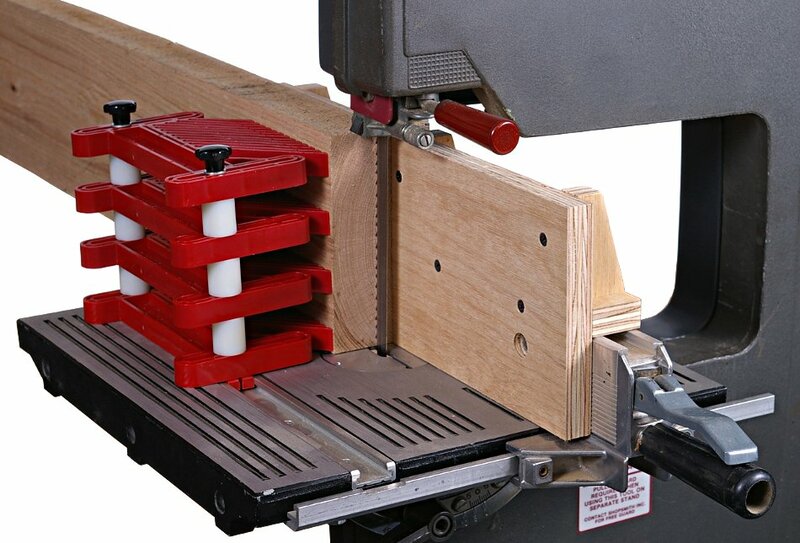 This stackable set of four Shopsmith featherboards is just the ticket for applying consistent sideways pressure on wide or tall workpieces when panel-raising, edge grooving, bandsaw resawing or any of a host of similar operations. 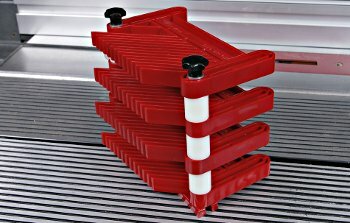 Assemble the set into your choice of • one 4-high unit or • one 1-high and one 3-high unit or • two 2-high units. The set consists of: (4) Featherboards • (4) Knobs • (2) Expanding Miter Slot Bars • (6) Spacers and • all of the hardware necessary to build any of these configurations. Here's a drawing showing featherboard heights and the recommended stock holding thicknesses, based on the number of featherboards in your stack. 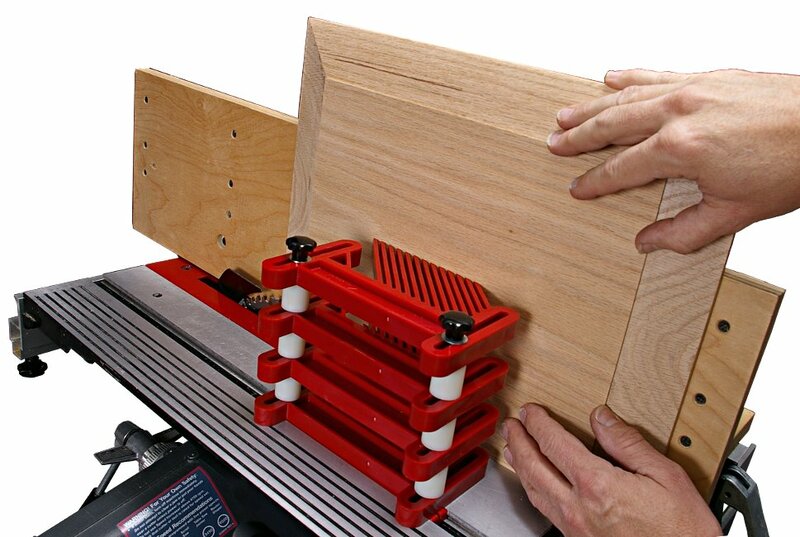 Use these stacking featherboards with the Shopsmith Auxiliary Fence or with your shop-made auxiliary fences on any model Mark V or Mark 7 as well as with your Shopsmith Bandsaw (works with either older or newer bandsaw tables). The Safety of all woodworkers is Top Priority. Use the Feather Board to press work pieces against the rip fence. Mount the feather board in either table slot. One of the unique items in the Shopsmith Safety Kit. Feather Board fits into miter slot of Shopsmith equipment held with 2 knobs and a slide bar..
C: Feather Board The feather board is used to press stock against the rip fence or the table. 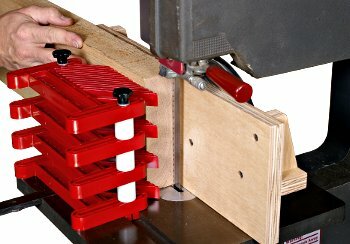 Mount the feather board in a table slot, in the slot of a fence extension, or clamp it to the table. The fingers must be angled in the same direction that you feed the stock-use the arrow on top of the feather board as a guide. Position the fingers so they press against the stock just before it gets to the blade or cutter, then tighten the locking knobs. To reverse the direction of the fingers, remove the mounting bar, turn the feather board over, then replace the bar. Experienced woodworkers recommend the use of these accessories for safety. In March of 1985, Shopsmith was honored during theNational Safety Council's 1984 Awards for Achievement in Product Safety Consumer Product Category for the development of the Shopsmith Safety Kit... a set consisting of four ingenious devices that have often been copied by others. The objective of this program is to recognize organizations which have significantly contributed to public safety. The Shopsmith Safety Kit is a winner. Each item gives you positive control over the workpiece and provides an extra cushion of safety between you and the blade, cutter, or knife. 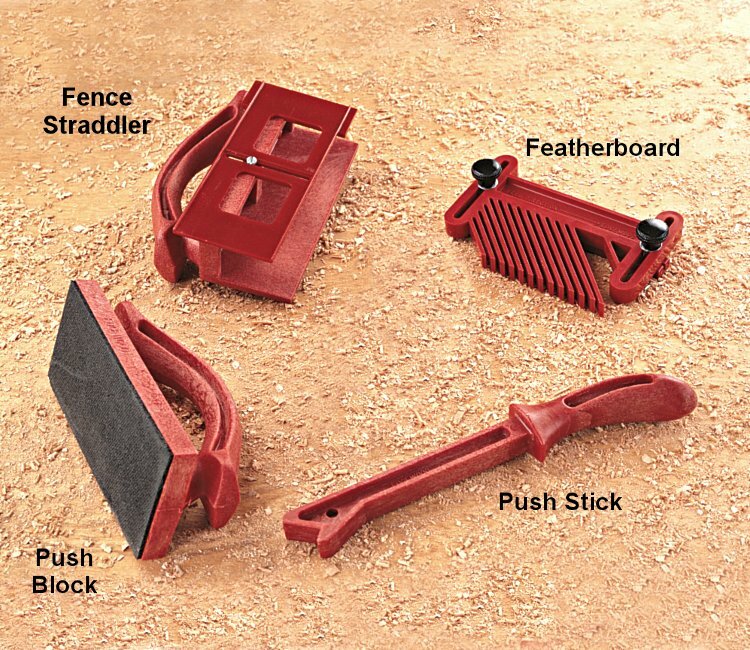 Push Stick • (2) Rubber-Soled Push Blocks • Feather Board (holds stock against fences) • Fence Straddler (for ripping). 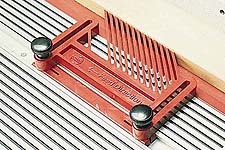 A: Push Stick The push stick is used to guide small to medium sized stock. Place the foot on top of the stock and hook the heel over the back edge. B: Push Block The push block is used to hold down and guide the stock. As you press down, forward, and to the side, the rubber pad grips the stock. The handle is tilted to help keep your hands out of the danger zone. D: Fence Straddler The fence straddler is used to hold down and guide small narrow stock past a blade or cutter. The body rides on the rip fence, while the heel hooks over the back edge of the stock. To change the height of the heel, loosen the locking knob. To reverse the heel, rotate the side 180°. Be sure the locking knob is secure before using the straddler. 518215 Feather Board Suitable for Mark 7 and Mark V 500 510 and 520 models Award-Winning Shopsmith Safety Kit Keeps Hands Out of Harm's Way C: Feather Board The feather board is used to press stock against the rip fence or the table. 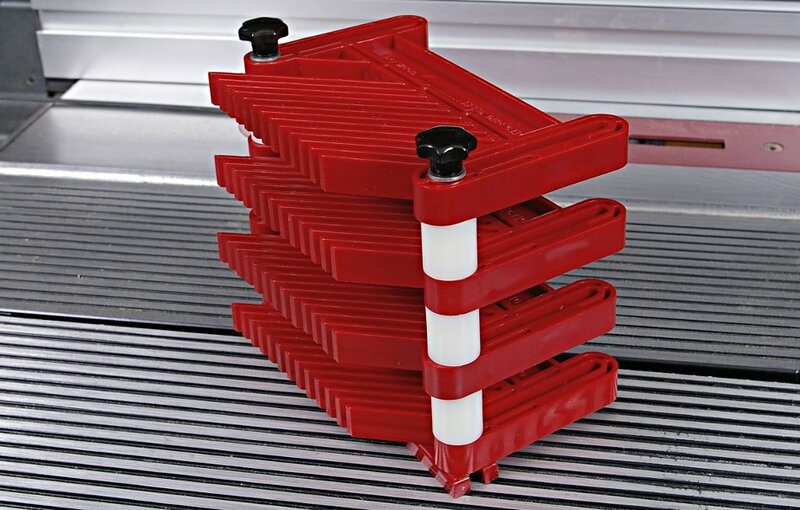 518221 Push Stick Suitable for Mark 7 and Mark V 500 510 and 520 models Award-Winning Shopsmith Safety Kit Keeps Hands Out of Harm's Way A: Push Stick The push stick is used to guide small to medium sized stock. Place the foot on top of the stock and hook the heel over the back edge. 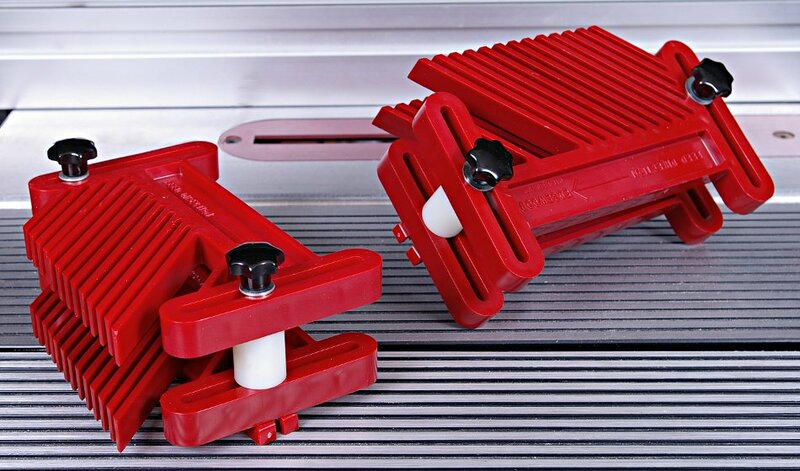 518220 Push Block Suitable for Mark 7 and Mark V 500 510 and 520 models Award-Winning Shopsmith Safety Kit Keeps Hands Out of Harm's Way B: Push Block The push block is used to hold down and guide the stock. As you press down, forward, and to the side, the rubber pad grips the stock. The handle is tilted to help keep your hands out of the danger zone. 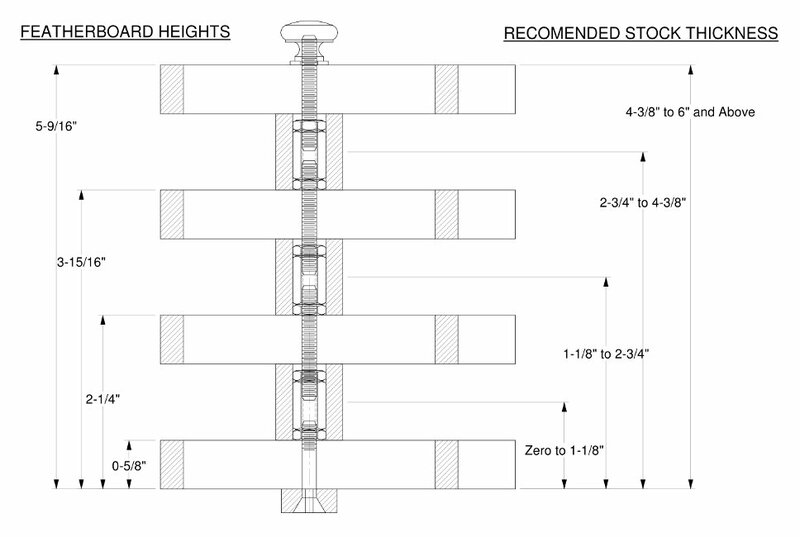 518218 Fence Straddler Suitable for Mark V 500 510 and 520 models Award-Winning Shopsmith Safety Kit Keeps Hands Out of Harm's Way B: Push Block The push block is used to hold down and guide the stock. As you press down, forward, and to the side, the rubber pad grips the stock. The handle is tilted to help keep your hands out of the danger zone. 521107 Fence Straddler Suitable for Mark V 520 models Award-Winning Shopsmith Safety Kit Keeps Hands Out of Harm's Way D: Fence Straddler The fence straddler is used to hold down and guide small narrow stock past a blade or cutter. 555878 Router Table Feather Board kit (Pair) Suitable for Mark 7 and Mark V 500 510 and 520 models Award-Winning Shopsmith Safety Kit Keeps Hands Out of Harm's Way Feather Board The feather board is used to press stock against the rip fence or the table.